Snow Park Goa / Blog / Why Snow Park Goa Is the Perfect Place for Couples ? Have you ever thought of the idea of playing in the snow in Goa? Snow … and that too in Goa! Yes, this is very much a reality now and not something that you need to dream of – courtesy Snow Park! Along with the sprawling beaches and happening nightlife of Goa, Snow Park is one of the best attractions in Goa which now brings forth enjoyment and fun that is of an entirely different genre. But it is no less fulfilling. 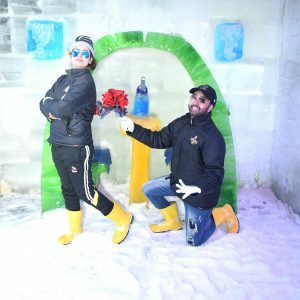 One of the most amusing Snow Theme Parks in India, Snow Park is now also a hotspot for the young couples of the country. Snow Park in Baga, has been established with the sole intention of offering an exotic spot in Goa. Couples can enjoy the cold comforts of the snow-covered amusement park at any time of the year. Be it the scorching summer heat or the dull rainy days, your search for the best place to spend some quality fun time is now over. Once inside Snow Park, it will only be fun ‘n’ frolic and cold to enjoy. If you are soon going to tie the knot, then a pre-wedding photo shoot at Snow Park is going to be an awesome idea! Just imagine how different the whole concept will be. While most couples prefer parks and beaches in Goa for their couple photo shoot before marriage, you can try out something unique and sensational. Head out to Snow Park and take pictures by cuddling up with your better half – won’t you guys look so much adorable in snowsuits like Eskimos! At Snow Park, you can build your own little igloos and carve out caves of snow. And what next? Go on clicking endless selfies and share them with friends and followers on social media. You can bet that you will be making all the other couples feel jealous about your grand idea. Let them follow you and see if they can really reach your couple goals. Besides, photo sessions in front of an igloo are something uniquely creative and alluring. You can look forward to more wonderful ways of bonding and enjoy each other’s company by playing around with snow, riding on the sledging car or sliding on the ice with the Snowman for company. Bring more diversity to your couple-time and enjoy togetherness at a different level at Snow Park. Who said Goa is only about sea and sand? Well, now that you have Snow Park for spending time in a different and more enjoyable way, you can look forward to enjoying the best time with the most special person in your life. Snow Park is one of those few places for couples in Goa that can truly offer you with a whole new world of thrill and adventure that both of you will cherish all your lives.